A very warm welcome to Kyffin (and his family)! I hope you will be very happy at your new Pre School. We are also pleased to welcome Georgina and Sam to the staff team. I am overwhelmed by the support and help I receive from our parents and committee, thank you so much to all that have helped with shovelling snow, printing rotas, grant applications, tip runs, garden tidies, cooking and being a parent helper. There is a new parent helper rota on the front door, please sign up, we would love to fill up as many spaces as possible. Please let your child’s key person know what your child has been doing at home, we can add their interests into the planning and it is lovely to share achievements and hobbies in their learning journeys. We have a sheet you can use or make your own! You may have noticed a few changes, in particular the toilet doors have been lowered to improve safeguarding for the children. We have been lucky enough to have Simon Graves, a local carpenter and joiner carry out some much-needed work, thank you Simon! The children are loving their wonderful garden and new mud kitchen and have been spending lots of time exploring and playing outside. Woodland Wednesday, is very popular and we have enjoyed making fairy homes, animal habitats and reading stories in the woods. Recent topics that we have been exploring have been, Doctors and nurses, Opticians, Dentists, healthy eating and keeping safe. The children have enjoyed putting a skeleton together, painting with toothpaste and a visit from Elena’s daddy, who shared his experiences of helping people to access eye tests in less developed countries. We were also able to see an eye test app and explore lenses for eye tests. The children and staff really enjoyed this! 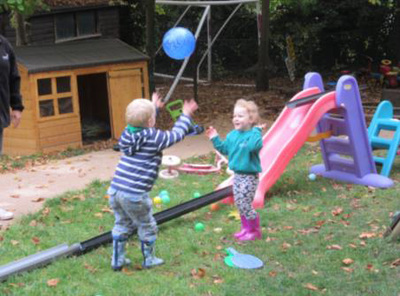 Pre School and the reception class at Streatley Primary school have been having regular visits to each other’s classrooms, this has been so much fun! Streatley Primary school is incredibly supportive to the Pre School and let us use their facilities and join them for ‘the daily mile’. The phonics evening at the end of January was very informative, staff and parents shared this training, it was delivered by Kirstie Hanson our Early years advisor. Thank you to everyone that attended. Please continue to send in healthy snacks, we are very grateful for all contributions. Breadsticks, cheese, fresh fruit and vegetables are always popular. Could I remind parents not to include nuts or peanuts in lunchboxes please, we have an allergy at Pre School and must be strict on this. We have had a couple of cases of headlice at Pre School, please check your child’s hair. Please see https://www.nhs.uk/conditions/head-lice-and-nits/ Many thanks. Safeguarding is everyone’s responsibility, please see myself or Jo if you have any concerns. Have you heard of EYPP? This stands for Early Years pupil premium and it is extra money that Pres School could claim to benefit your child and the setting, if parents receive certain benefits or are on a low income. Please speak to me in confidence if you believe you may be eligible. For children attending this session. For the children attending this session. The Great Easter Egg roll!! All children and their big people welcome. More information to follow. Happy New Year, I hope you’ve had a wonderful Christmas. Welcome to our new children! We have been talking about healthy eating at preschool and this week, we explored paint using cucumber, carrots, onion, parsnips and swede! We thought about what a Tortoise would eat and have enjoyed lots of art and craft activities. Next week we are going to look at the book ‘Handa’s surprise’ and we are planning to try lots of tropical fruit from this story. I would be really grateful for donations of pineapple, passion fruit, guava, banana, orange, tangerines, avocado, mango, kiwi fruit and any other healthy snacks you could donate including breadsticks, vegetables, rice cakes, cheese, dried fruit and spread (flora etc). Thank you so much for the lovely snacks that were brought in this week. Felix’s family have donated (and built) a wonderful large storage box for our garden, thank you so much! We have had so many offers of help from our parents, thank you everyone. We are very excited about the new Astro turf and mud kitchen, which the children will be able to enjoy next week. Thank you to Darcy’s family for organising the Christmas market and for everyone that helped, the money raised has been put towards this project. We now have a big storage box for the children’s lunch boxes outside the front door, don’t forget to collect your child’s lunch box at the end of the day. Woodland Wednesday has started again, can I please remind parents to send in wellies, suitable clothing (no scarves) and a change of named clothes for all children. Lots of children have been bringing toys to preschool and its been really hard to keep track of them and it can cause problems when other children want to play with them, if your child needs a comforter or soft toy that’s absolutely fine but could all other toys be left at home. Thank you for your cooperation with this. We are going on a visit to the foundation class on Thursday 17th January during the afternoon, this will be for the children that attend on that day. Other visits will be arranged over the coming months. If you haven’t returned your child’s summary report from last term, please return to your child’s key person ASAP. Designated lead Cheryl Allen/deputy designated lead Jo Sentinella. Kind regards and thank you for everything you do to support our amazing preschool. On the 12th October, we held our AGM at Preschool; it was wonderful to see so many parents attend and I’m delighted to welcome our new committee and pleased some of the existing committee are staying on. It was amazing to see just how much everyone cares about our Preschool! I’m really looking forward to an exciting year ahead. I would like to say a big thank you to Lise Spencer, for arranging with her gardener, to help tidy up the preschool garden. Matt Jeneson and Sara Anderson very kindly helped Shelley to clear a massive bag of leaves from the garden. Dave Payne, Emma Francis and Dan Harrow have been doing tip runs; this is a great help. Thank you, Gemma Jenkins, for coordinating the Christmas card fundraiser (the cards looked beautiful). Alison Hannigan, kindly did some pressure washing, this made the decking much safer and her Father, Ian Bell, has been helping fix some items in the Preschool garden. Georgina Kennedy organised an amazing spooky cake sale and lots of parents donated cakes and helped on the day. Danielle McCutcheon has been helping to laminate preschool displays and Claire Gould kindly made a new parent rota for the front door. Neil Aldridge, a local landscaper has donated some turf, we are so grateful. We have received so many offers of help and healthy snacks and donations of useful items for Preschool, thank you everyone! I’m in need of some lidded storage boxes for the garden, if anyone has any spare ones at home. I would also like a set of sturdy kitchen scales for our cooking sessions and cooking utensils, including saucepans and spoons for the new mud kitchen (it will be at Preschool soon). let me know if you can help. We have been exploring leaves using different materials including clay. The children have been learning all about Autumn and we have displayed some of their beautiful pictures. We built a pumpkin village, used tongs to play with jelly and pasta and hammered golf tees into different sized pumpkins! We had a fantastic dress up day before the cake sale on 17th October and the children loved getting their faces painted by staff! We have enjoyed lots of new songs, including ‘Baby shark’!!! The children love cooking and have made cheese and tomato pastry bakes, bread stick sparklers, raisin and chocolate cookies and cupcakes. We have new waterproofs, for the children to use in the woods and on wet days in the garden. The children have been enjoying lots of woodland activities; they made houses out of straw, twigs, and bricks and acted out the story of the three Little pigs. From 2nd November, the Friday morning children are going to the Primary school, to join in with their ‘Pantomimus’ music workshop, for 6 weeks, (it’s about 30 minutes) This is really kind of Miss Roberts to extend this for our Preschool children. I have arranged some visits to Coombe House, details will follow. We also have Tracey Taylor from ‘Helping Rhinos’ coming in to talk about her work, on Monday 19th November (during the morning). Please sign up to help at preschool, the rota is on the front door. It’s so helpful to have an extra pair of hands and a fantastic opportunity to see what happens at Preschool, maybe a grandparent or special person would like to help? Healthy lunches are always encouraged at Preschool, please ensure your child has a suitable portion size, having too much food can take a long time to eat. Please cut grapes length ways and avoid nuts. Many thanks. At Preschool, we believe safeguarding is everyone’s responsibility, please speak to Cheryl A, Jo or any member of staff if you have a concern. Welcome back everyone! Term 1 has got off to a flying start. We have had 10 new children join preschool, a very warm welcome to our new children and families. We have been having lots of Pirate fun and the children have made an amazing display, listened to Pirate music, been on treasure hunts, made Pirate sensory bottles and listened to pirate stories. Thank you to everyone who came to our new parents meeting on the 5th September, it’s been wonderful to hear such positive feedback from so many parents and we look forward to an exciting term ahead. Thank you so much for the kind fruit donations and please keep them coming, the children have enjoyed healthy snacks of fruit, vegetables, cheese and crackers. As the weather gets colder toast and crumpets are a great snack option. We have been so lucky to have a new rug bought for our book corner, by Perdie’s family. Many of you have donated cushions, toys and some waterproofs (we still need some more waterproof trousers) we are incredibly grateful, thank you. There is a parent/carer sign up sheet on the front door and we would love as many Parents/Carers or special people to help for a session, it’s a great way to support pre-school and is a brilliant way of finding out what your child has been doing and of course you can catch up with your child’s key person! We do have an open-door policy and please feel free to speak to your child’s keyperson or myself at any time. 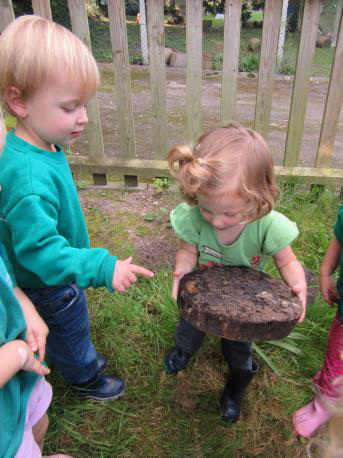 We will start Woodland Wednesday again on 19th September-please ensure children have suitable footwear and clothing, long trousers and wellies are a must! This year Pre-school will be taking part in a Christmas card fundraiser, the children will have a go at designing their own cards; there is a poster up on the notice board and more information will follow (so hold off on buying cards!!). Remember safeguarding is everyone’s responsibility, if you have any concerns, please speak to myself as the safeguarding lead or Jo Sentinella as the Deputy safeguarding lead. Key Message: If you wish to increase your child’s sessions for the summer term, we have some spaces in the afternoon sessions ( children can attend if they are already attending the morning session).Please let Cheryl know before 5th March 2018. What an exciting time we are having at Pre-school! We are learning about keeping healthy and safe. The children have been expressing their feelings and are brilliant at sharing how they feel, they have been using thumbs up, thumbs down or one of each! We have been doing lots of singing and its been wonderful to see so many children wanting to sing to the whole group; we may have some future stars! We held a very successful health clinic role play at Pre-school and the children learnt all about keeping healthy and the effect exercise has on their bodies. Aadi’s family kindly lent Pre-school a real blood pressure monitor, you will be glad to know staff checked their blood pressures and we are all fine! The children listened to Handa’s surprise; while eating pineapple, mango, banana and passion fruit at snack time. We have been cooking and the homemade pizza was very popular (of course it has lots of vegetables on top to encourage healthy eating.) The children have also made some very interesting sandwiches…...Yummy. The children made a Pelican crossing and Belisha Beacons to use in the garden. Staff followed this up with a Topsy and Tim book about safety, read on the iPad. The children have been using the crossing with their ride on toys in the garden and have really enjoyed making sure we use our ‘road’ safely. Half term week is Monday 12 th February 2018 until Friday 16 th February 2018. After half term, we will be looking at Phonics. We will go on a Phonics hunt and be looking at ‘s’ sound. Thank you so much for the yogurt pots that have been brought in; the children will be growing Cress and we are going to start gardening, with the aim of growing something to eat at snack time. The children have suggested that we grow strawberries, tomatoes and carrots. If anyone has any spare plants, compost or gardening tools, please speak to me. A massive thank you to everyone that has donated something for snack, please keep healthy snacks coming! There is now a sign-up sheet at Pre-school for Parents, Carers, Grandparents etc to attend one of your child’s sessions over the term. This is a valuable opportunity for you to see your child learning through play at Preschool, chat to the staff and your child’s key person or Buddy and share and add to your child’s learning journey; it will also mean an extra pair of hands and enable staff to offer more learning opportunities for the children. If you wish to increase your child’s sessions for the summer term, I have some spaces in the afternoon sessions ( children can attend if they are already attending the morning session).Please let me know before 5th March 2018. Thank you for your continued support and I hope you all have a fantastic half Term break. Welcome to Term 5. I hope you have all enjoyed a good break over Easter! Easter Egg Roll The children enjoyed performing their Easter songs and rhymes and rolling their eggs down the slope in the garden. We were very proud of all the children, as they performed their songs so beautifully. Coombe House Some of the children visited the residents at Coombe House to share our Easter songs. This was so popular, that the children were taking ‘requests’, so ended up singing many traditional songs together with the residents too. The children then finished with a Christmas song – last year’s songs remain incredibly popular!! Chicks We also visited the newly-hatched chicks at school. The children all watched the chicks in the incubator before having an opportunity to stroke and hold them. Easter Egg Hunt Last weekend’s Easter Egg Hunt was a great success. Thank you to Mr and Mrs Farr for letting us use their beautiful garden, Jo Haywood for organising the event, all the parents who volunteered and of course, to everyone who attended. The children are enjoying participating in their maths activities with the researchers from Oxford University. This has now been extended to include most of our younger children too. We will continue to support all the children in preparing them for school as the end of this year approaches. In particular, we will be supporting the children to be independent in dressing themselves and using the toilet without adult help. If you have any questions, please do not hesitate to contact your child’s key person. The children will get the opportunity to visit their new schools – your child’s school will be writing to you with further details. In addition, for those children who are going to Streatley, Mrs Skinner and I will be organising informal visits and activities over the coming months. We are looking for any unwanted kitchen utensils to use in the mud kitchen and also plastic water sprayers for plants. All donations gratefully received! As you will all be aware, I will be leaving Pre – School at the end of Term 6. Whilst I am looking forward to the challenges of my new role, I will be very sad to be leaving Streatley. I have had five very happy years here, during which I have had the privilege of working with wonderful children, families and staff. Thank you to everyone for their kind messages of support – I really appreciate them. In the meantime, we are currently recruiting for a replacement – if you know anyone who may be interested, please let Clare, Laura or me know. Welcome back from your half term holidays! An especially warm welcome to Wolfy and his family who have joined us this term. Cake sale A huge thank you to Susan (Freya’s Mum) for organising the cake sale at the end of last term, and also to those who baked (and bought!) the delicious cakes. The sale raised an amazing £114.50. Coombe House Last term we were able to visit the residents at Coombe House to share stories and to take along Valentine’s biscuits as a gift. We are looking forward to developing this special relationship over the coming months. Easter Rhyme Challenge The children were so enthusiastic about the Rhyme Challenge at Christmas, we have decided to repeat this – not least as many of you have reported that your children are still singing Jingle Bells! We are picking an Easter theme, and the songs will be sent out to you very soon. For those of you who are not familiar with the Challenge, the children learn several new songs and rhymes, which they practise both at Pre –School and at home. They then ‘perform’ these to an audience. Active Kids Vouchers We are now collecting Sainsbury’s Active Kids Vouchers. Please bring in any that you already have, and ask friends and relatives for theirs if they are not using them. The more we collect, the more resources we are able to provide for your children! Toys from home Please could you ensure that your child does not bring in their precious toys from home? These often get lost or broken, which causes a great deal of distress. Interested in helping out? 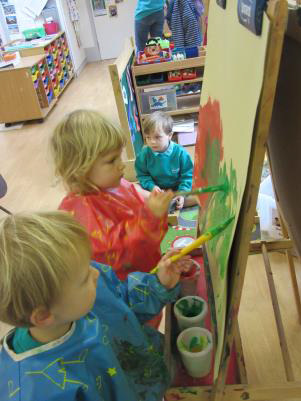 We welcome all offers of help at Pre–School! This can involve reading stories, sharing a skill or interest or simply coming along for a play! If any parents, grandparents or carers would like to come along and help during a session, please contact me. We would particularly welcome any storytellers, musicians, builders or woodworkers who would be happy to come and share their expertise! Happy New Year and welcome back to Pre-School! An especially warm welcome to all the new children - Channan, Nayan, Lucy, Megan, Autumn and Thomas and their families who have just joined us. Christmas The children all enjoyed their Christmas activities, in particular, the trip to the theatre and the Christmas party on the last day of term. Huge thanks to Susan (Freya’s Mum) for organising both of these events, and to everyone who helped with the party. We were also delighted to be able to visit our neighbours at Coombe House at Christmas, and we hope that this will be the start of a very special relationship between us. Thank you to Caroline (Betsy’s Mum) and Jo (Sophie’s Mum) for helping us on the day. Singing our Christmas songs at Coombe House. Rhyme Challenge The children were all really enthusiastic in learning and performing their Christmas songs for the annual Rhyme Challenge. In fact, they developed such an interest in rhyme this year, that we spent many a happy hour sharing rhyming stories (particularly ‘Oi, Frog’!) at their request, and several of the children had a go at making up their own rhymes, choosing real and imaginary words that rhyme with their own names. All the children who took part in the challenge will shortly receive a certificate. Football and music sessions Our Friday morning football sessions will re-commence this week. These run from 9.45 – 10.15 on the school field. If your child does not attend a Friday session, they are still welcome to join us. We just ask you to accompany them in order to maintain our staffing ratios. Please ensure your child brings suitable shoes/boots on the day. Musicians from the Palmer Ensemble will continue to visit us once a month on a Thursday morning, following their concerts in Goring. The dates for these visits are as follows: 2nd February (to be confirmed), 2nd March and 6th April. We are very fortunate to be able to provide this experience for the children. Again, please feel free to come and join us if your child does not normally attend Pre – School on a Thursday. School admissions Please note that the closing date for school applications for September 2017 in both West Berkshire and Oxfordshire is January 15th. If you need any help with this process, please do not hesitate to contact me. Interested in helping out? We welcome all offers of help at Pre – School! This can involve reading stories, sharing a skill or interest or simply coming along for a play! If any parents, grandparents or carers would like to come along and help during a session, please let us know! Maths Research In partnership with researchers at the University of Oxford, we have been invited to take part in a study investigating the development of children’s early mathematics skills. The researcher would like to work with those children who will be starting school this September. This is, of course, totally voluntary and your consent will be sought beforehand. Further information will follow shortly. Welcome to Term 2 – ‘The Glittery One’! The children have settled back in well after the half term break, and we are all looking forward to the exciting term ahead! We go outside in all weathers, and as the weather is rapidly getting colder, please can you ensure that your children arrive with suitable clothing – coats, hats, scarves and gloves, wellies, waterproofs if you have them and plenty of changes of warm clothing for when they get wet and muddy! As you will have seen on our medium term plan, we are supporting the children to learn to put on their outdoor clothing independently. You will shortly be receiving a ‘Next Steps’ sheet from your child’s keyperson. These will explain the steps that we are working towards with your child at Pre – School, and some ideas of how you can support these at home. You can apply for schools in any area in a single application. The deadline for school applications in both West Berkshire and Oxfordshire is January 15th 2017. Please don’t hesitate to ask if you need any further advice or support. If you would like any additional hours after Christmas, please can you let me know as soon as possible. I will be handing out forms this week. Our numbers will be increasing next year, but we will be able to accommodate some extra hours in the afternoon. Please note, our Tuesday morning sessions are full. Thank you for completing the ‘password’ forms. These will enable us to improve our safeguarding practice. There are still a few forms which have not yet been returned – please could we have these as soon as possible? Please let me know if you need another one. The ‘Going home’ book has been replaced with a form. The person collecting your child will also sign the form when they collect your child and we will note that they have shown us ID and given the password. The children are all enjoying our cooking activities, and we are looking forward to baking Christmas cakes with them in the next few weeks. If anyone has any cooking equipment or utensils that they are happy to donate, we would be most grateful. In particular, we are looking for a cooling rack (ideally a tiered one), measuring spoons and spatulas. The children will be taking part in the Rhyme Challenge this year. This involves learning a selection of songs and rhymes which they will ‘perform’ for you at the Christmas party. Details will follow shortly. Friday 16th December. Last day of Term 2 and Christmas party. Details to follow shortly. Term 3 starts Wednesday 4th January 2017. Happy New Year to everyone! We hope that you had a wonderful Christmas and welcome you all to the start of the Spring Term. The children have all settled in to Pre - School very happily. We would like to extend a warm welcome to all the children and families who have recently joined us and to Lisa, our new staff member. Thank you so much to everyone who helped at the Christmas Shopping Night and Christmas Party, and particularly to Vics (Archie’s Mum) and Susan (Freya’s Mum) for organising these. Both were really special occasions and a wonderful way to finish our year together at Pre – School. No nuts or sesame seeds, please. A reminder that we have a child with a severe nut and sesame allergy, so please ensure that you do not include either of these in your child’s lunchbox. Thank you to all those who have completed and returned the ‘Next Steps’ sheets that we handed out last term. These help us to work together more effectively with you and to build a better picture of your child’s development. If you have not yet handed your sheet back, it is never too late! We like to go out in all weathers, so with the temperature set to dip, please can you ensure that you send your child to Pre – School with coats, hats, boots, scarves and gloves and plenty of changes of clothing (including spare socks!!) as well as footwear to change into. Please can you label these wherever possible. As a ‘next step’ all the children will be working towards putting on their coats and boots independently. All parents, grandparents and carers are invited to come in and read stories with the children at the end of a session. Please speak to any member of staff if you are interested. A final reminder to all parents with children due to start school this September – the closing date for applications is this Friday - January 15th. To be able to co-operate with routines and boundaries. To develop mark – making skills. To be able to dress and undress independently. ​To listen attentively to stories. To understand and follow instructions. To use language to share ideas and experiences. ​To enjoy a variety of stories, songs and rhymes. Children to be able to give a meaning to the marks they make. To gain confidence in counting. To develop understanding of shape, space and measure. To be able to explore and describe their natural environment. To be able to use the digital cameras. Adult led group activities such as cooking. 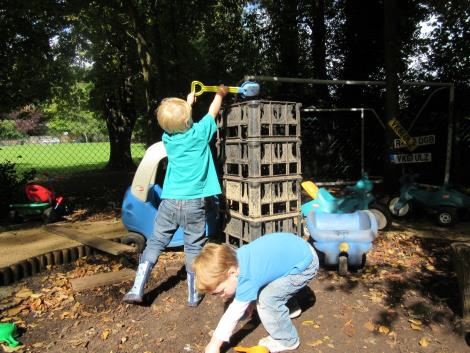 Working and playing together - eg building dens, setting up building sites and home corner role play. Supporting children to join in at tidy up time and help set up at snack time. 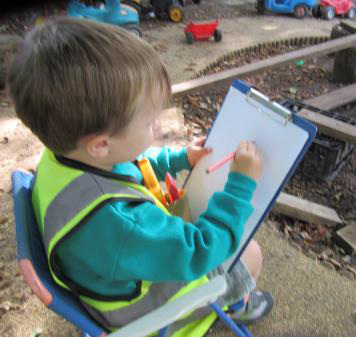 Provide a wide range of mark-making experiences in both indoor and outside environment. ​Encourage children to put on coats and boots independently. Adult – led activities such as cooking, planting and playing simple games. Set up a nature - themed interest table. Encourage children to talk about their photos from home. ​Provide a combination of ‘favourites’ and new stories, songs and rhymes. 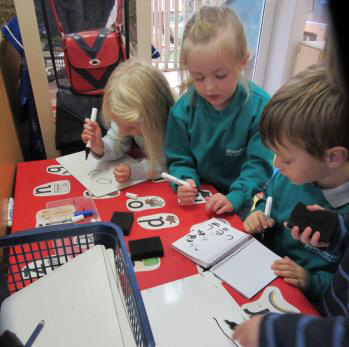 Provide a wide range of opportunities and resources for mark-making. Support children to talk about their marks. ​Singing number songs and rhymes. Provide opportunities for counting in everyday activities. 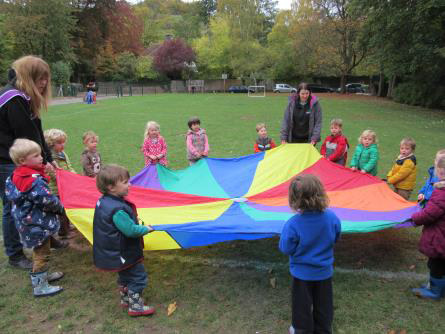 Provide opportunities to explore shapes in both indoor and outside environment. such as more/less and heavy/light in both play and adult – led activities. Encourage children to bring in natural objects for the interest table. Look for signs of autumn in the garden and woods. 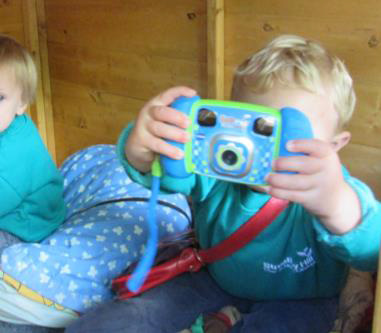 Provide opportunities for all children to take photographs. ​Rotate construction materials. 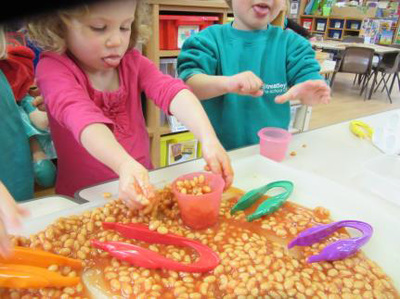 Support children to think about what they would like to make and the materials they might need.